Thousands of F-train commuters signed Gary's petition. Later he testified before the MTA Board and at City Council and State Assembly hearings on transportation issues. As an advocate for public transportation, Gary found his issue and his voice. This powerful experience also cemented his belief that public transportation is an equalizer and an important engine of democracy. "It creates mobility which equals opportunity," Gary told me. It also ties in with environmental sustainability, another issue close to Gary's heart. "Transportation policy dovetails with development policy, land use, how we view our streets, how we share our space and making the city safe for pedestrians and cyclists," he said. The F-Train petition experience also convinced Gary that he would one day run for office. But he didn't think it would happen quite so soon. It was when he realized that Bill deBlasio was at term limit that he decided to jump in. But not before asking his wife how she felt about it. "Let's do it," she said. And that was that. I highly recommend reading the entire series as they are posted. I've also read her profile of Bob Zuckerman, and it is a refreshing to get a look at the candidates in their own words. I know I am eagerly awaiting the next installment. Times architectural critic Nicolai Ouroussoff has a good piece up on the importance of planning and a strong government role in modern day urban renaissance. The problem in America is not a lack of ideas. It is a tendency to equate any large-scale government construction project, no matter how thoughtful, with the most brutal urban renewal tactics of the 1950s. One result has been that pioneering projects that skillfully blend basic infrastructure with broader urban needs like housing and park space are usually killed in their infancy. Another is that we now have an archaic and grotesquely wasteful federal system in which upkeep for roads, subways, housing, public parkland and our water supply are all handled separately. With money now available to invest again in such basic needs, I’d like to look at four cities representing a range of urban challenges and some of the plans available to address them. Though none of the plans are ideal as they stand today (and some of them represent only the germ of an idea), evaluated and addressed together as part of a coordinated effort, they could begin to form a blueprint for making our cities more efficient, sustainable and livable. The parts on the Bronx and Buffalo make for particularly good reading. The Pratt plan for eliminating the Sheridan Expressway and reopening the South Bronx waterfront is a stroke of genius. And when it comes to Buffalo, a high speed rail connector that ties Buffalo to NYC and other cities in the region (both in the US and Canada) would be a major boon. 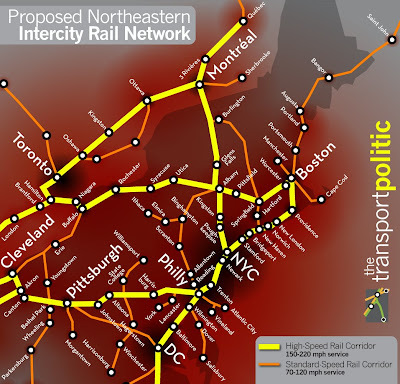 Image above of Northeast High Speed Rail Network taken from The Transport Politic. The Chair of CB6 was thoughtful enough to share this article from the New York Law Journal with the Community Board. Vapor intrusion is a potentially harmful condition in which volatile chemicals in soil and groundwater emit fumes that enter buildings; such chemicals are often present at old industrial properties, or where a former industrial property has been redeveloped for commercial or residential use. In the past, many state environmental regulators, including the New York State Department of Environmental Conservation (NYSDEC), had not included vapor intrusion as a consideration when granting closure for cleanup of contaminated properties because the general thought was that chemicals could stay in the ground under a building, as the foundation was a barrier preventing contact with those chemicals. More recent evidence has shown this is not always the case, as some chemicals can penetrate foundations at levels that raise health and safety concerns for the occupants. However, NYSDEC and other state regulatory agencies granted hundreds of site closures without always accounting for the possibility of vapor intrusion exposures. Over the past several years, NYSDEC and the New York State Department of Health (NYSDOH) have been investigating the vapor intrusion issue, including reopening "closed" remediation cases and setting new standards for human exposure. Other states (e.g., California, New Jersey) are taking similar steps with respect to vapor intrusion. Thus the concept of the new law clearly is a good one. However, NYSDEC, which is largely responsible for enforcement of the Tenant Notification Law, has to date offered no formal interpretive guidance on the applicability of the law or how it will be enforced. As discussed further below, there are numerous vague and undefined terms and ambiguous provisions in the statute that have created confusion and challenges for the regulated community members and their advisors. The whole article is worth reading for those that don't mind getting into the weeds of a legal discussion. Tonight I attended the meeting of Auto-Free New York, which as you might imagine is a transit advocacy group. The focus of the meeting was a presentation on Bus Rapid Transit (BRT) by Joan Byron of the Pratt Institute. Byron started off with an in-depth introduction to the subject matter that focused on inequity in transit accessibility and commuting times across the city. The summary is that for a high percentage of poor and/or minority residents, commuting times often exceed an hour, whereas accessibility to white collar jobs and the homes of (largely) white people is far better. The solution put forth by Pratt together with COMMUTE, is BRT. Byron pointed to BRT programs in Curitiba, Brazil and Bogota, Colombia as examples of BRT success, along with the "Select Bus Service" operated along the B12 line in the Bronx. The B12, however, is not a BRT system; rather it incorporates a few aspects of BRT service that are more suited to a New York environment. First, the B12 lets riders purchase tickets in advance and board from both doors on an "honor system" that is enforced with spot checks and summonses for farebeaters. Second, parts of the bus route are painted and enforced as bus only lanes. Third, technology on board the bus can make sure that the bus always gets a green light at intersections. prioritizing transit over individual vehicles. Here's the rub: as Cap'n Transit has laid out in excruciating detail, THIS IS NOT BRT. It's also no replacement for rail transit, which while expensive, is the efficient core of a successful transit system. I encourage Pratt and COMMUTE to focus their advocacy on driving the following improvements to the entire MTA Bus system: (1) off-board payment and dual door boarding, (2) signal prioritization for buses, and (3) bus lane enforcement cameras mounted on MTA buses. These are fairly cheap, readily implementable improvements to the existing bus system that would dramatically improve bus service, and bus utilization, throughout the city. I would hate to lose sight of the goal of improving transit outcomes for poorly served areas by focusing on a concept (BRT) over results. We can make incredible service improvements to our bus system - and we don't need "BRT" to do so. Our bus system is an essential complement to our rail network that can and must be improved, dramatically. But to maintain a sustainable transit system that can serve the needs of a growing city, we will have to continue to expand our rail network. Lastly, it is worth noting that one of the primary success stories held up as a BRT exemplar, Curitiba, is replacing it's BRT system with . . . subways! I've got a lot more to say on this syubject, but I wanted to put something up while the meeting was still fresh in my mind. Good night! This is highly disturbing. George Weber, a radio reporter and blogger (whom I've only just now learned about) was brutally murdered this weekend in his apartment on Henry at 1st Place. That is just over a block away from me. Weber, who would have turned 48 today, was discovered half-naked in his bed shortly before 10 a.m. inside his apartment with his throat slashed and more than a dozen stab wounds to his neck. His hands and feet were bound with duct tape, sources said. There were no signs of forced entry at Weber's apartment on Henry Street in Carroll Gardens, sources said. The bathtub spigot was running and the place had been ransacked, said one source, who described the home as "a bloody mess." Detectives were investigating the possibility he knew his attacker. George's blog can be found here. It's also a disturbing reminiscent of that stabbing murder on Carroll Street last year. Both victims were killed in their apartments, with stab wounds to the neck. This is some seriously disturbing stuff. Update: Coverage from Gothamist and The NY Daily News. Mia and I went to the dinner last night, which was well attended by politicians and candidates. The Daily Gotham's mole333 has a rundown of the evening's events . . . why reinvent the wheel? Click through for a lengthy description of the awards. MTA Telethon: The Ghost of Transit Future? Transportation Alternatives takes a look at what the future might hold if the Senate continues to fail spectacularly to address the MTA finance crisis. It ain't pretty! Wow. I just read the news on Brownstoner that Bob Guskind, well known for his Gowanus Lounge blog and for his contributions to Curbed, has passed. OTBKB has a more detailed post on Bob's untimely passing. Katia also has a piece in memoriam. This is truly a black day for Brooklyn. Bob's blogging was partly responsible for my own foray into blogging. I was inspired by his passion for Brooklyn's neighborhoods and his love of "iconic" structures that hearkened back to our industrial past. I first met Bob at a CGNA meeting at Scotto's funeral home in 2007. He was an outsized, softspoken, friendly man with an output I could never hope to match. We are all poorer for this loss. You'll be missed, Bob. A lot of well-meaning people still put some stock in what Tom Friedman has to say. I tend to get frustrated trying to explain that while Friedman is occasionally right, and usually sounds quite reasonable, he has been disastrously wrong with an alarming frequency. Most notably, Friedman has been wrong about essentially everything he has ever written about Iraq. This Vanity Fair piece lists a few other memorable Friedman gaffes. Toll Brothers City Council Hearing Tomorrow! To the surprise and consternation of many, City Planning broke out the rubber stamp for the Toll Brothers requested re-zoning of their parcel on the Gowanus Canal. Part of the surprise is that City Planning approved Toll's plans on February 17th . . . while the first inkling members of the community got was from Pardon Me For Asking on February 28th. One more indignity in a process that has been flawed from the beginning. The Toll Brothers site is being re-zoned, by itself, ahead of the broader Gowanus re-zoning that is currently being studied. Why? One of the biggest selling points that Toll used in seeking approval for this re-zoning was the promise of affordable housing. It turns out that the affordable housing was a chimera; when CB6 went back to condition their (unfortunate) approval of Toll's plans to condition it upon required inclusion of affordable housing, Toll cried foul. So now we have a major change of zoning for a parcel that was considered outside of the zoning process for the rest of the Gowanus region, which if approved will have zero requirements for affordable units. UPDATE 3/3/09 - POSTPONED! I'll post the rescheduled details when available. An fyi, there is scheduled meeting tomorrow at CB6 offices at 250 Baltic Street at 4pm to discuss traffic conditions and safety proposals, including rerouting commercial truck routes. Craig Hammerman, CB6 District manager and Joseph Palmieri, Brooklyn Borough DOT commissioner will attend. Consequently, this meeting will be important as effective representative leadership will be on hand. I encourage anyone and everyone interested in participating in this strategy discussion to attend. It is informal and an important community issue. Thoughts and implemented ideas are likely to set the tone for other streets in our increasingly residential neighborhood.